Leicester has a bit of an image problem – it hasn't really got one. Located somewhere between the Home Counties and The North in that most ill defined region, the east midlands, it is probably the least known of our big cities. And it is a big city – with a population of about 500,000 in the conurbation it is the 10th largest in England. But in both its character and its scale the city centre is disconcertingly uncertain if it is that of a big city or not. However it is actually a very interesting place, quite distinct from its rather anonymous hinterland. With its long history, very evident, at least if you look for it, its late expansion, clean industries and relative prosperity right through the C20th Leicester is very different from the big northern industrial cities. The nearest comparison is to Nottingham although without its Drama Queen of the Midlands stuff – Leicester's character is more subtle. Writing in the 60s Ian Nairn found Leicester's character difficult to define but he appreciated the quiet understatement of the city and praised its broad minded tolerance – a characteristic which has been important in its relatively successful transition to what will soon be the first majority non white city in the country. It was the sprawl of Leicester and its impact on the countryside around which disturbed Hoskins. Although one of England's most historic cities it does its best to hide this. Your approach from the M1 is particularly depressing. Around Junction 21 is the huge edge-city of Fosse Park, a dark counterpart to the city centre and predictably just outside the City boundary. It takes its name from the Roman Fosse Way with the park bit presumably referring to the sea of car parking and token shrubbery around the boring out of town shopping complex and dreary offices which have done much to weaken the city centre economy. 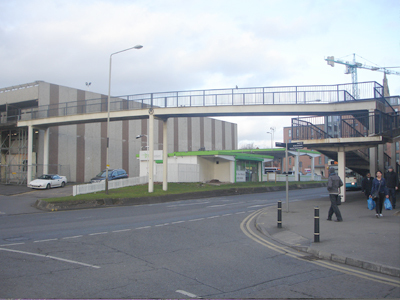 The dual carriageway along the old Fosse Way leads you into the city centre at St Nicholas Circle, a huge roundabout and underpass constructed in the early 1960s. In the middle of the roundabout is the Holiday Inn looking almost Californian and suitably accessible only by car. 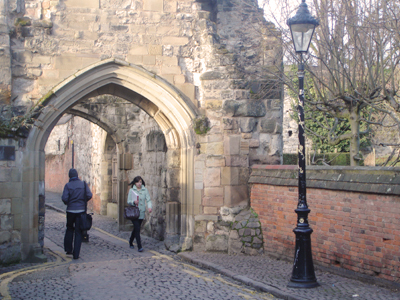 This was the centre of medieval Leicester which until then had been a remarkable survival. It was wiped out quite casually as was the custom at that 'brave new world' time - a massive tragedy, bitterly recorded by the eminent local historian Jack Simmons. The slender elevated concrete walkway across St Nicholas Circle is now a period piece – an interesting memory of how the future was meant to be. It links the bleeding stumps of Old Leicester. 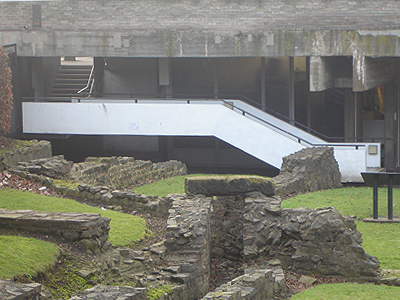 To the north are extensive Roman remains and many artefacts in the excellent Jewry Wall museum. This is housed in a thoughtful building of the 1960s, cloister like with recessed arcade, which embraces the Roman remains with Jewry Wall itself and St Nicholas (Anglo-Saxon nave and Norman tower) to the east. It is a pity the long view is spoilt by naff new flats with curly blue roofs. To the south is St Mary de Castro founded 1107 with a wonderfully picturesque (rebuilt) tower together with the historic enclave of The Newarke. This is picture postcard stuff as long as you screen out the hideous cheaply built student flats nearby. The view of St Nicholas with Jewry Wall and the Holiday Inn may in time achieve iconic status. The old A6 road from London gives a much better introduction to the city. You approach through leafy Stoneygate, surely one of the pleasantest suburbs in England with many Arts and Crafts inspired villas including houses by Ernest Gimson, a Leicester man and one of the leading figures of the movement. Closer in is the slightly bohemian suburb of Clarendon Park. Past Victoria Park, London Road leading down to the Station is quite a grand street, although a bit scrappy in places. Leicester University is to the west. 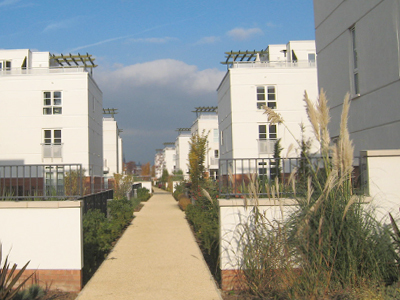 New Walk, a unique promenade laid out in 1785 and lined with (mostly) very handsome buildings, links the University area with the city centre – a masterstroke of planning. The route into Leicester from the north along the old Fosse Way is also interesting. Belgrave Road is a lively high street full of Asian shops and restaurants and unlike so many high streets not ruined by traffic and the dominance of highway engineering. It works really well and there are fantastic lights for Diwali. Sadly it is severed from the city centre by not one but two inner ring roads with flyovers. The initial impression on arriving by train at Leicester is disappointing. 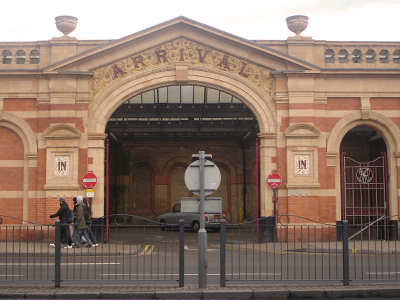 The station was rebuilt by British Rail at its nadir and is lacking in presence, that is until you step out into the amazingly grand and long porte-cochere fronting London Road – 1892 by Trubshaw for the Midland Railway, with fine brickwork, faience lettering and a domed turret. This is used for taxis and 'executive parking' which is I suppose appropriate but passengers have to pick their way though the cars or scuttle down a little ramp to reach the street. Surely this impressive space should be renovated and converted to provide a stunning foyer for a big city station, as has happened in Trubshaw's Sheffield station. The grand façade of Leicester station flanks no civic space but a massively over engineered junction of the inner ring road. Opposite are blank and apologetic 1980s offices (brick with turrets) that look as though they ought to be in Leeds. At least the hateful subway under the ring road has recently been replaced with a decent pedestrian crossing. 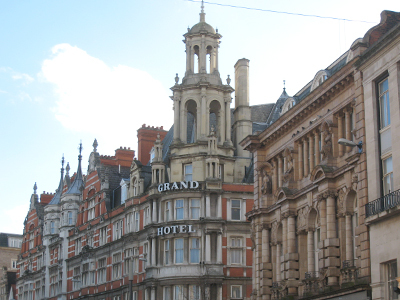 Once you reach Granby Street it is immediately apparent that you are in a city of very impressive late Victorian and Edwardian buildings. The finest is the worryingly vacant former Midland Bank designed by Joseph Goddard (1870) in C13th Gothic style. Goddard was one of the big names who shaped Leicester's architecture. He also designed the fairly absurd Clock Tower at what was the epicentre of the city (at least until the Highcross shopping centre opened recently). Nearby and off the main street facing a modest square (a very typical Leicester understatement) is the delightful Town Hall (1875 by local architect Francis Hames) in a vaguely Queen Anne style. 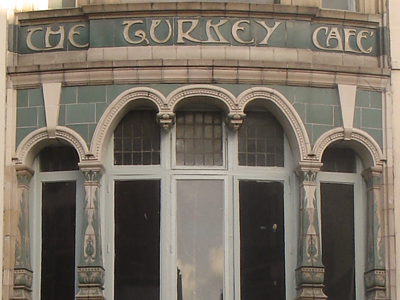 Leicester clearly flourished at the turn of the C20th and there are some fabulous art nouveau buildings including the Turkey Café on Granby Street (1901 by Wakerley), a riot of glazed terracotta. 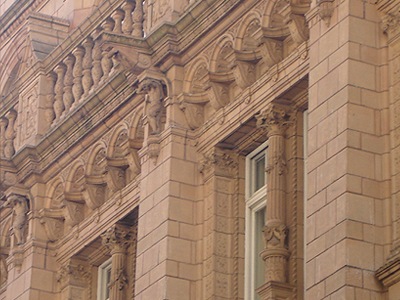 Coronation Buildings on High Street is a baroque Edwardian extravaganza by the same architect. Nearby is a domed former chemist shop with faience advertisements still in situ. As you investigate the streets to the west and then the north of the Town Hall the Georgian, medieval and finally Roman origins of the city are clearly revealed. Streets like Friar Lane retain a coherent feel of the pre industrial townscape and in Silver Street or Cank Street you could be in a market town like Newark. The outdoor market is magnificent and huge, like something in Flanders. The permanent market structures limit your appreciation of the Market Place as a space but this is a price worth paying for the vibrancy of the market, surely amongst the best in the country. There is also a big indoor market built in the early 1970s looking remarkably like the Haymarket Centre (see later). The internal levels are a bit complex as at Sheffield Castle Market, which does not help it to function well. 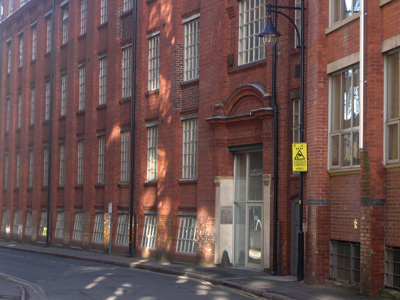 Leicester's industries were clean, unspectacular and diverse – its factories fitted comfortably into the town alongside the terrace houses, very different from cities with heavy industry. Many are modest, even utilitarian, structures but satisfying in their proportions and simplicity. Often they have terracotta flourishes at entrances. 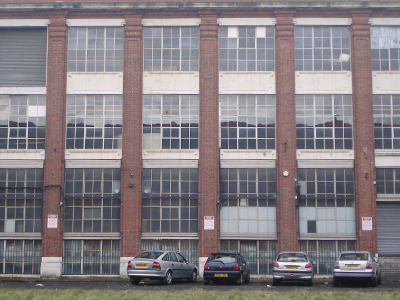 There are much grander factory buildings including the stunning Corah works at St John Street. A very fine cluster is found between De Montfort University and the Royal Infirmary (the distinctive iron frame Luke Turner factory of 1893 and the beautiful 1913 cream brick Harrison and Hayes building). 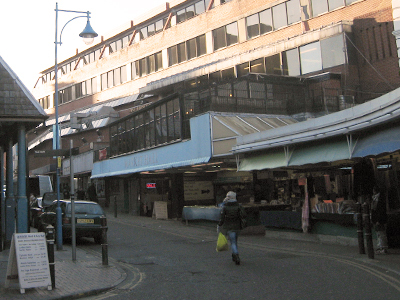 Rutland Street is the nearest Leicester has to a commercial quarter like Little Germany in Bradford. It is now the Cultural Quarter (of which more later). 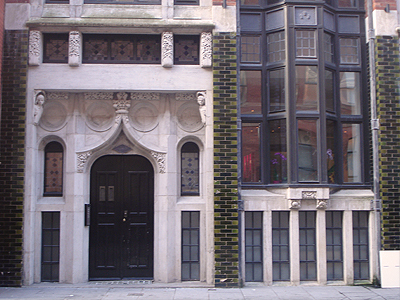 Note particularly the extraordinary 78-80 Rutland Street (1923) with strong American influence. 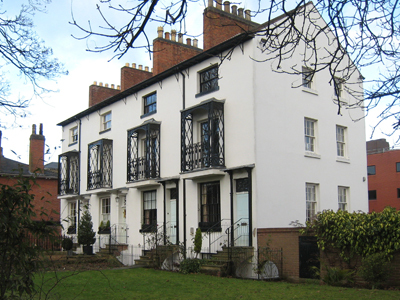 With few natural features to constrain it other than the River Soar (partly canalised as the Grand Union), Leicester developed as a very compact town. Its distinctive red brick terraced streets, often dominated by grand Board schools, churches and factories, are a very impressive urban morphology, although this has not always been appreciated. Harold Nicholson who was a local MP recorded 'We passed through Leicester and I gazed out on that ugly, featureless city, thinking how strange it was that I had for so long been identified with those brick houses with their iron railings and their clean little steps'. Even at the time this was a patronising view. The 'desert' of red brick terraces was in fact highly successful and has proved very adaptable. 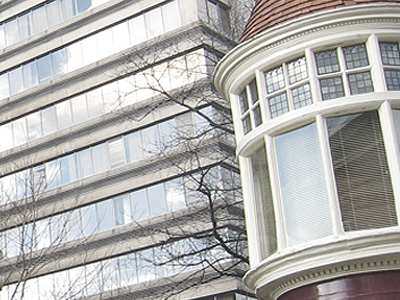 In our terms a very sustainable town and Leicester became Britain's first 'Environment City'. Leicester's heyday was the 1870s to the 1930s and this is very evident from the extraordinary flowering of the architecture of these years. 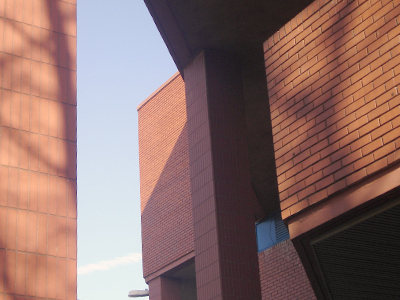 With the outstanding exception of Stirling's Engineering Building at the University - one of the most thrilling structures in Britain - the architecture of post war Leicester has been a disappointment. This was not for want of plans. Leicester was one of the first cities in the country to set up a Planning Department in 1962 under Konrad Smigielski. He put forward visionary plans for rebuilding the city centre with high level walkways and a monorail but little came of them. The City Engineer and Surveyor got there first with his plans for three ring roads and as we have seen the most destructive parts were then already under construction. The British Association 1972 publication on Leicester comments 'A walk in the central area … would give the impression that the city had undergone a recent bombardment by enemy action'. Leicester had actually escaped significant wartime damage. In the 60s Leicester seemed a go-ahead place and the Lee Circle multi storey car park, formerly with a Tesco and bowling alley beneath, is a reminder that there was some innovation and drama in the planning and design of that era. However the quality of most of the many 60s buildings is beyond banal. The most impressive structure of the 1970s is the powerful office tower next to the Station, now a hotel but rendered ridiculous by painting the concrete blue and Lenny Henry purple. 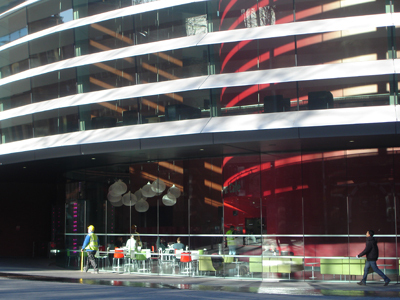 The two curved blocks of the New Walk Centre, one of 14 stories, are an impressive statement. The Haymarket Centre, clad in strident red brick, was for long reviled but now with hindsight looks quite impressive, especially in the sculptural drama of the main entrance. The integral theatre reached by the grand flight of steps is now closed, replaced by the Curve. Leicester, a manufacturing city, was clobbered by Mrs Thatcher. The first major regeneration initiative was at Bede Island (between the Grand Union and the Soar). This had been the Great Central Railway (destroyed by Beeching - it would have provided a ready made HSR line to the north). 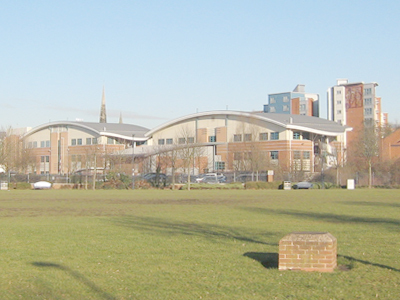 The new offices and accommodation for De Montfort University are pretty bland and the new housing is particularly disappointing, as is the central open space – you couldn't call it a park. Under Blair the Leicester Regeneration Company was set up which commissioned a more ambitious master plan for the city centre, inevitably involving themed 'quarters'. Quite a lot of this has been successful, especially the Highcross Centre. This extended the dingy Shires Centre with a whopping John Lewis store - an enormous shiny box designed by Foreign Office Architects and linked by a bridge across the ring road to another huge box - a car park dressed with some flats. 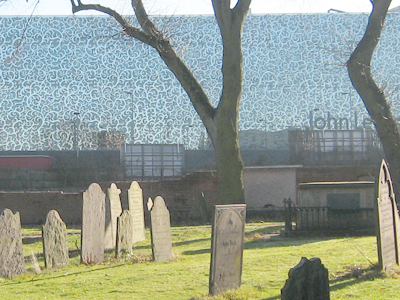 Viewed from the churchyard of the Norman All Saints (marooned in the Waterside area and desperately waiting to be regenerated) the new store looks stunning. It is not quite so wonderful from the hostile ring road. There is a clever open square with posh shops and restaurants between the new store and the Shires which has added a cosmopolitan buzz to the city. The awful ring road at least allows much of the centre to be pedestrianised and the City should be commended for its recent very excellent repaving designs with high quality materials and street furniture, which really lift the place. The planners are also grappling with the ring road legacy, although the recent Magazine Gateway scheme is a bit half hearted. 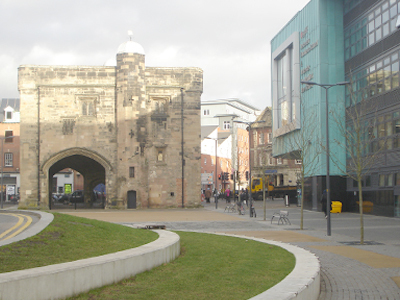 This medieval gateway was surreally left in the middle of the ring road but this outrage has partly been redeemed by closing one carriageway to enable a new square to be created which re-unites the Magazine with the Newarke. It also provides a new focus for the formless De Montfort University campus but the layout and design is disappointing, still too deferential to highway demands and sadly not actually using the Magazine as a pedestrian gateway. Also the new Business and Law building is very blue and very dominant. 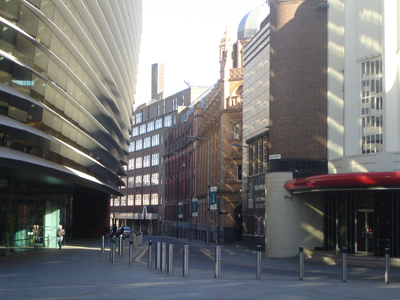 The Cultural Quarter around Rutland Street is quite a success with its centre piece the Curve Theatre by Rafael Vinoly fitted cleverly onto a tight site and making a virtue of its constraints. 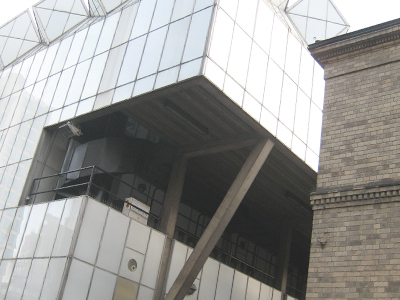 The Phoenix Film Theatre on Midland Street by Marsh Grochowski suffers from being subsumed within a block of flats beyond the coherent townscape in the wasteland towards the ring road. 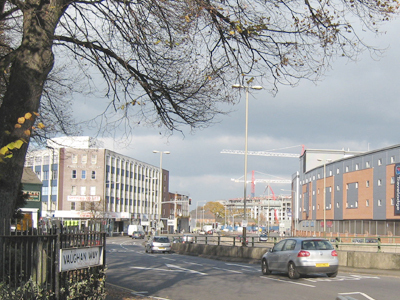 The Office Quarter nearer to the Station shows some signs of success with the quite elegant Colton Square development. However the office market in Leicester is now mostly (and most unsustainably) out at the motorway junctions – thanks to Mr Pickles' predecessor and soul mate Nicholas Ridley. Plans for city centre housing have not fared so well. 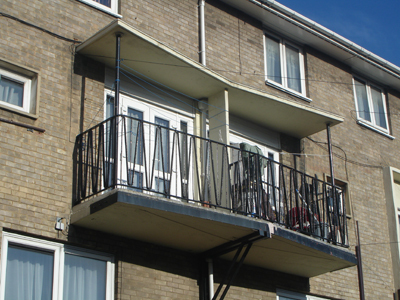 Although there are plenty of new apartments these are mostly the usual mean, standard designs piled far too high and without any place-making or quality public space. Even worse are the many hideous blocks of Lego-like student flats with their horrible cladding and gormless small windows. Many are strung out along the ring road reinforcing its dislocation and anomie - as bad as anything put up in the 1960s and a very bad call for Leicester. As in most cities the market has not cracked how to deliver high density family housing in the centre. The best and really quite creditable scheme is Freeman's Meadow, next to Bede Island. This is an attempt at modernism, although arguably pastiche modernism, but provides a humane environment, with some quite good landscaped areas. Other schemes along the Waterside have not materialised, despite the temptation of the location - Reiss and Carluccio's just across the ring road in Highcross. Leicester is a place of surprising contrasts especially between the market town scale of much of the city centre, the big city fin de siècle buildings and the monstrous insouciance about scale and context that characterises most of the new building around the ring road. Similarly there is a telling contrast between the confidence and exuberance of the early C20th buildings and the shoddiness of so much post war stuff and between the exceptional coherence of the streetscape in the core (south of High Street) and complete lack of any attempt at urban structure and design around the ring road. Many people dismiss Leicester as boring but it is a fascinating city although one that does not reveal itself easily. The place is stuffed with interesting buildings and I have only been able to highlight a few in this short blog. 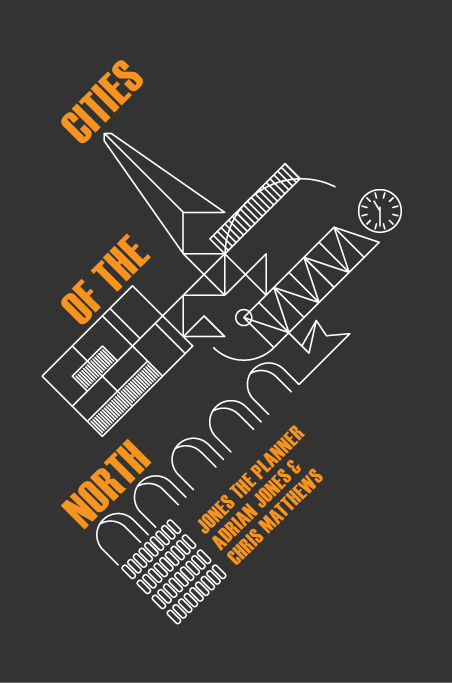 Although this does not do justice to the diversity and interest of architecture and planning in Leicester I hope I have illustrated some of the more important aspects of the urban character and context of an under-appreciated city which is well worth exploring. Further blogs are planned looking at Leicester's universities and the Leicestershire hinterland 50 years after Ian Nairn's famous journey along the A5. A dazzling selection of beers and good food were served at The Pub, New Walk. Really nice post, though there's a couple of very interesting buildings not covered including Lutyens' war memorial and entrance lodges at Victoria Park and Short Ford's bizarre Queen's Building - http://www.habitables.co.uk/architecture/fifty-buildings-50-years-riba-exhibition. Thanks Charles. 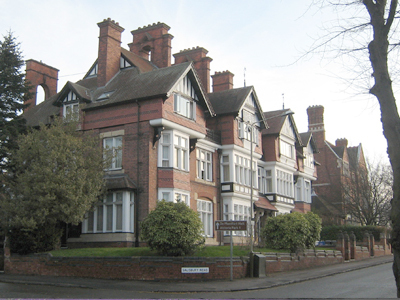 Totally agree about the buildings you mention but as there is so much in Leicester we decided to do another post specifically on the two universities including the Manor Road area. The Queen's Building is definitely very weird! Fantastically well written and thoughtful article. Completely agree with the "undiscovered" sentiment expressed. The city reflects the people - understated, subtle and almost self deprecating to the point of non-existence. I hope the tag of "first majority non-white city" does not hinder the city but instead becomes the catalyst for a successful 21st century. 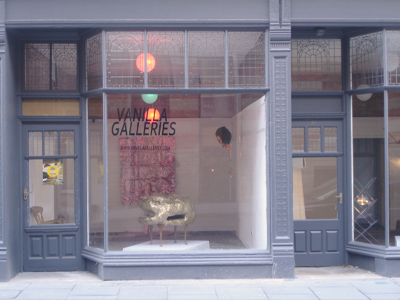 Brilliant blog really captures the contrasts and idiosyncrasies of the city. There is so much to celebrate and so much to despair about Leicester's building's I am quite sure a book rather than a blog will suffice. Looking forward to the next installment. Excellent mix of description, comment and illustration which capture the feel and presence of the city very well. A much needed introduction to somewhere neglected and patronised so often. Leicester doesn't have the blindingly obvious presence of York, Durham and the rest of the litany, nor does it show easily the fashionable edginess presented in cities elsewhere. Remarkably, the above piece from the local rag doesn't see fit to mention the fact that it's 1870 by Sir George Gilbert Scott, of St Pancras Station Hotel fame. Photos here of St Saviour's very grand interior. You've covered some of the buildings already. It's horrible to tick off how many of the 42 in that excellent photostream are empty/disused, even derelict. Though not all of the 42 are terrific imo. I'd miss out All Saints (nothing special as redundant medieval churches go, a dull interior, but a pretty garden/graveyard at the back and an interesting animated clock on the North exterior very noticeable from the road and recently well restored, or more like rebuilt and/or recreated, by the local Freemasons' Lodge. Even so, not really worth a detour. And miss out the much photographed and vulgarly OTT Jain Temple, Hideous location with the usual cluttered riot of gods inside. Peepul Centre is not really worth a detour either. Apart from it being a funding disaster and hopelessly underused (as is Curve, so far; and the new Phoenix Cinemas, aka Digital Arts Centre. But those are all Leicester stories of incompetence and corruption yet to be told). Glad to see both circular "Pork Pie Libraries" included (1939, SP&P) one of them has a wonderful unaltered interior, shelves and all. I think it is the one on the outer ringroad.It was derelict when I saw it, but I think now back in use (??) closer to home, couldn't their circular form have been suggested by Hanson's circular Baptist Chapel in the City Centre on Belvoir Street, now crudely incorporated into the Wellington Street Adult Ed complex. The interior is sadly much mutilated, but with little glimpses of what once must once have been impressive, but the distinctive circular exterior onto Belvoir St is still there. Or is it too silly to suggest the libraries' shape could have been inspired ..... by a pork pie? Glad to see the Guild for the Disabled building (1909, Sawday and Sawday) in there. Don't miss it, a hidden gem. Especially inside. Goddard's Silver Polish Building (1932) is goodish Art Deco but was much mucked about when it was made into a "Business Centre" about 20 yrs ago. Now looking much unloved. I prefer the bold Deco of Blunt's Shoes, Granby Street, over the new pedestrian crossing from the railway station. National Space Centre (2001, Grimshaw) Exceptional, brilliant. Avenue Road House (1958) I've only seen it from the street but I find it very beautiful. It's the garden front and the garden itself though that people rave about. And the interior with all its original furniture, Still occupied apparently by the original, now of course elderly, owners who commissioned it in the first place! News Room, Granby St (1898) love it, especially the statues of the Muses, and the lettering. I'm not sure if any interior survives at all. YMCA, Granby St. Yes a riotous exterior with some terrific statuary but don't miss the sadly mutilated but much used small Victorian musichall theatre inside. Face away from the cruelly absent proscenium arch, long gone, and the inappropriate modern louvered ceiling and enjoy the perfect horseshoe auditorium. Try to see the upstairs Circle with its surviving and very uncomfortable bench seating. An excellent venue for standup comedy, jazz, acoustic music and more. We're very lucky to have it! Leicester knocked down at least three large Victorian theatres in the City Centre after the war. Including the Leicester Opera House on Town Hall Square, now a totally forgettable 1960's Building Society office. So now we have nowhere at all to receive touring commercial theatre work (the "upgrading" of De Montfort Hall around 10 or 15 yrs ago was a ludicrous miscalculation by Leicester City Council). Compare and contrast with Nottingham, Birmingham, Sheffield, Bradford etc theatres and weep! Btw, bad error later on in that photostream. De Montfort Hall was certainly NOT NOT NOT built by the son of the notable Harrison architectural practice, it was built by their DAUGHTER (see the plaque in the lobby by the main doors). As such, now that the Stratford Memorial Theatre (1932, Elizabeth Scott and others) has mostly been demolished isn't De Montfort Hall one of the very very few prewar buildings in the UK by a woman architect?? Anyone know any other good ones? Maybe the flags in the wonderful, powerful Lutyens War Memorial in Victoria Park are stone. I've always thought they were fibreglass! Anyway they're certainly not cloth. There was supposed to be a grand avenue of trees leading from the gatehouses. Now much interrupted by horrible carparks, ticket machines etc. But the other axis does have Peace Walk with its memorial slabs not only to the Women of World War Two, but also to three named Leicester casualties of the International Brigade that "fought Fascism in the Spanish Civil War" and a (rare?) plaque to the survivors of the 1950s Nuclear tests in the South Pacific. You can see that Peace Walk was intended to be part of another ambitious vista/approach, right down the hill of Lancaster Road then alongside the Prison wall in the far distance. Only thing is the main London railway line cuts straight across this fine idea on an ugly flat steel girder bridge currently painted with yellow and black chevrons in a massively unsuccessful attempt to stop errant double decker buses clouting it. What was the idea? Put the railway in a cutting as per a few yards nearer the station? Or that railways would simply become redundant and disappear?? Anyway the planned vista is much interrupted, even blocked, as it is, and the railway must have predated the War Memorial and its planned vistas by a century or more. Going back to the Lutyens flags, it always seems to me that Leicester has an unusually high number of flagpoles, particularly on city centre and old industrial buildings! Just start looking and counting. I wonder if it's because Leicester's hosiery industry used to make the flags. That's my theory anyway. St Joseph's Catholic Church, Uppingham Road (1968, Wilson) Again, do try to get inside (not easy, maybe try on a Sunday!) Lots of very good detailing, eg the little bronze statuettes of saints and the door furniture. Apart from the bold use of space and light and the glorious campanile. The church is on a gentle rise so the bold campanile/tower is visible for miles. I was told that Tom Wilson also designed cinemas. IF true, it makes sense! One of my favourite buildings in Leicester, inside and out. Ismali Jamatkana looks very good. I must seek it out. Hi there, I'm the chap who took those photos Philip mentions, and thanks for taking the time to look at them. Just a few points. The murals inside St Marks have never (despite rumours to the contrary) been vandalised and can still be seen in all their glory (there's a photo somewhere on my photostream). The most damage that was done to them was by pigeon droppings. The place was covered in them before it was restored. Shirley Harrison, the architect of De Montfort Hall was a man. At least that's what I've been told. It would be great if I was wrong, as you say, very few women architects get the recognition they deserve. Darker Street is a disgrace to the developers who own it, not the city council, who have done just about everything in their (actually quite limited) powers to keep them from falling down, including forcing the owners to do some repairs recently. I have been very vocal in my support of Curve and the new Phoenix and will continue to be. I think the council has done a great job bringing that area back from dead under very difficult circumstances. Of course the council has made mistakes (hasn't everybody?) but I really do think that Leicester has been improved greatly by it's projects over the last 20 years. Annnyyyyywwaayyyy...getting back to the blog. I just wanted to say that it's excellent and says (and illustrates) some of the things I have failed to say (or have said badly) over the years! Leicester is easily dismissed but has a lot of offer anyone who can be bothered to see beyond the inner ring road. I would be more generous about the Magazine development. Compared to what was there before this is a great improvement. Thank you for an excellent blog that shows a lot of insight. 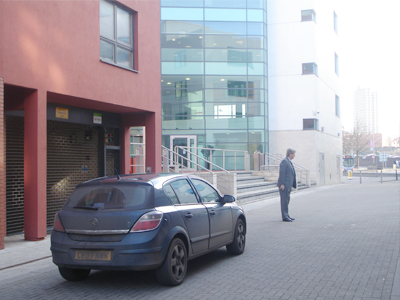 One small error has crept in regarding the multi-storey car park in Lee Circle. Underneath was a Tesco supermarket, but the bowling alley was on the ground floor of the six-storey block built parallel to the car park in the middle of the circle. I worked for several years in that building and spent many hours in the bowling alley, which later became a disco. Thank you for this ultimate blog. A good city planning can change the face of the city and this city is well planned. Urban preparing just isn’t usually carried out ahead of a city takes form; it may be utilized efficiently in remodeling, expansion, or enhancing the living conditions in an existing city. symetrical wheel-spoke shape is a great advantage and it's mostly surviving old street pattern must be retained. It's immense outer suburbs will change over time and anyway few are really bad by national standards. I am particularly interested in the comparison between Leicester and Coventry where I worked for a number of years. Poor old Cov has suffered immense damage from short sighted town planning over 75 years, the bombing played a relatively minor part. The great old place now has a downbeat air and is desperately short of confidence. Really it cannot compete with Leicester and the people deserve more, perhaps you could take a job there and get started on a job that will take half a century. Great blog anyway and I wish I had your educated eye. Thanks for your kind comments Mike - nice to have civic voice on the blog. However, I couldn't disagree more about your comments regarding Coventry, although I know you're certainly not alone here. The city had to re-plan because it was a mid twentieth century combustion engine boom town hemmed in by a medieval street pattern. The result is a wonderfully coherent and walkable city centre with every amenity available. The city is one of the best examples of British modernist design and the Cathedral by Basil Spence is an architectural masterpiece. Abstract and semi-abstract public artworks are delightfully dotted around the town - the interwar years of struggle for British modernist art finally coming to fruition. I will agree that the city is down on its confidence but such confidence is misplaced when it is based on the mythical Experian Retail Rankings, which actually end up promoting homogeneity. Anyway, I could blather on all day, but I advise you to read Adrian's article on Coventry and take another look. That's the thing about Cov Chris,it's nearly impossible to get a consensus.Actually I was in Cov last week to check out the old priory visitor centre.Took the park and ride because like many I can't do the inner ring road.Everytime I go they have blurred Gibson's vision with another attempt to make the centre consummer friendly.You know a lot of Cov people shop in Nuneaton or Birmingham now because they can't bear what's happened.The city has many fine buildings still including some excellent modern examples (I am not actually a fan of Spence's cathedral,a little cold for me).The trouble is they do not hang together at all well. Just been to Exeter which was also badly bombed and I find it much more coherent,clever control of traffic without a ring road,retention of almost all surviving ancient buildings,fine new shopping precinct,and they have incorporated the 1950's buildings really well so no sense of shame here. Smaller than Cov it is true but it doesn't really feel it.The centre will need little alteration for many years so attention can turn to the typically untidy inner suberbs. With Cov my only real wish is that they ask the people what they want and do their best to give it to them. Thanks for that Mike, will keep that in mind. Yep - Exeter is on our list, though I've been before and found it very walkable and pleasant (but wasn't taking notes at the time). I imagine that there might some historic and contemporary parallels with Lincoln (Asa Briggs stuck them in the same category in Victorian Cities), which is also quite good at the moment in terms of planning. I wonder, during the past thirty years have some of the Cathedral cities fared better than the industrial? 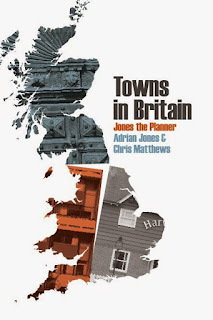 Hi - I've been trying to find a copy of a 'Townscape Analysis of Leicester' by Kenneth Browne and Ian Nairn that was quoted in the Leicester Traffic Plan of 1964. You mention Nairn's writing and I wonder if you know anything about the Analysis? Hi Colin, sorry but can't help; would be interested to see the analysis. I was quoting from a Listener article I remember reading but can't find atm. Nairn articles often quite difficult to track down. I've just discovered this blog, following a recommendation. The comments on Leicester are absolutely spot on - thanks for articulating so clearly what I've been arguing about Leicester for so long. 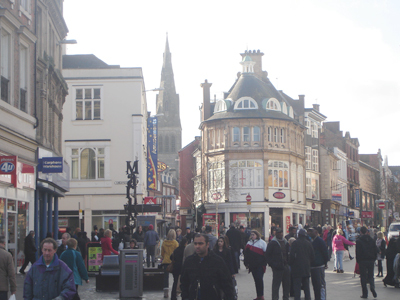 A recent visit just after Christmas confirmed your comments about the successful pedestrianised areas; High Street is now traffic free, and the setting of the Victorian and Edwardian buildings is wonderfully enhanced. I liked, also, the new square that has been created at the far end of High Street from the Clock Tower. A source of much whingeing in the local press, but that's nothing new in Leicester. A couple of other points - apologies if I missed any reference to St James the Greater - but this church on London Road, near Victoria Park, is a wonderful building by Henry Goddard, athough you'll need to make arrangements if you want to get inside. The former Midland Bank (another Goddard triumph) has been purchased, I believe, by the developers who did such a good job on St Mark's church. And an addition to the bibliography - Geoff Brandwood's 'Bringing them to their knees: church-building and restoration in Leicestershire and Rutland 1800-1914'. Thanks again! Only four years late, but the Coventry-Leicester comparison or juxtaposition is an especially interesting one. I have family from both cities and as a child observed the progressive changes being imposed on Cov' City Centre, mid-'60s to early-'70s. Having visited both places in the last few years (I don't live in Britain now), Leicester seemd such a livable place compared to the constant change being imposed on Coventry, to the degree its centre really appears to have reached the point where its been rubbed out to such a degree that in some places the paper's been worn through (especially e.g. around Far Gosford Street, due to aggressive Uni' developments). I once wrote to Yale Uni' Publications, asking if they wouldn't be willing to consider bringing out a Pevsner City Guide to the two cities combined (as fat, I suppose, as updated Manchester/Salford etc. one) but, of course, no response. This is really an informative post review. I am very glad to get this post article and nice information. I was looking forward to get such a post which will be very helpful to us. A big thank for posting such kind of an article in this website. Keep it up. Just a follow-up to Philip's comments about the YMCA......in fact the original proscenium IS still there, as are the stage ends of the balcony......they just all got hidden behind the false proscenium that was erected in, I believe, the 1970s. It was necessary - without it the stage would only be 6 feet deep! There was already a false proscenium prior to the 1970s alterations, when the ceiling louvres were fitted. (I first lit a show in there in 1975, before the alterations). The theatre was actually built as a lecture hall, with a much shallower stage (hence the original prosc) which was also lower than the current stage. It was, however, definitely being used as a theatre by the 1920s, though never full-time. In the early 1990s some plans were drawn up to extend the stage at the rear, add a fly tower, revert to the original proscenium and remove the louvres, re-revealing the stained glass windows at high level. Sadly these plans fell through. It's not really fair to call the theatre "mutilated", though that may well be a fair way to describe what has been done to what is now the bar area and the residential parts of the YMCA building! This is such a detailed and in-depth post! It really does cover it all, I learn't so much from reading it. I might be mistake but Queen Street Apartments I believe use old buildings for some of their apartments! I think it's great how all the residents of Leicester keep its history going!